With the arrival of summer the first thing comes to our mind is grilled/baked veggies. 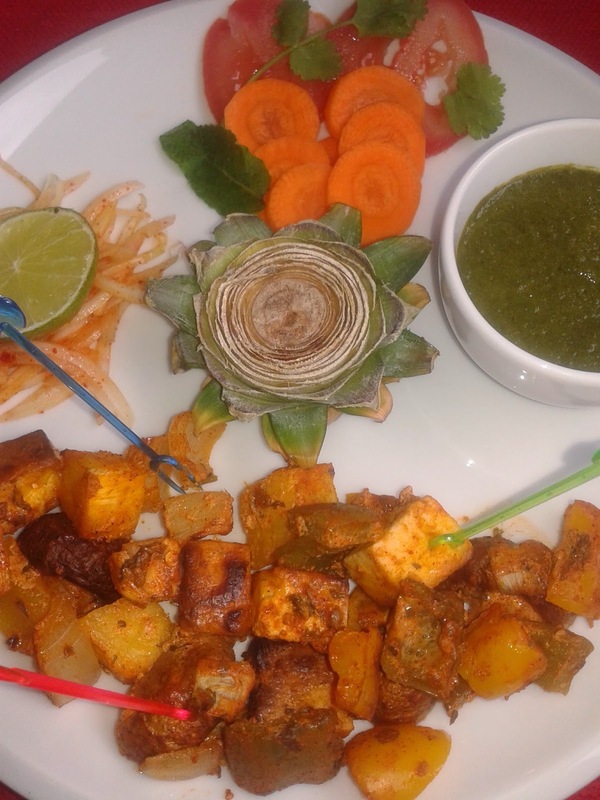 All the veggies in one dish and healthy also, WOW !! 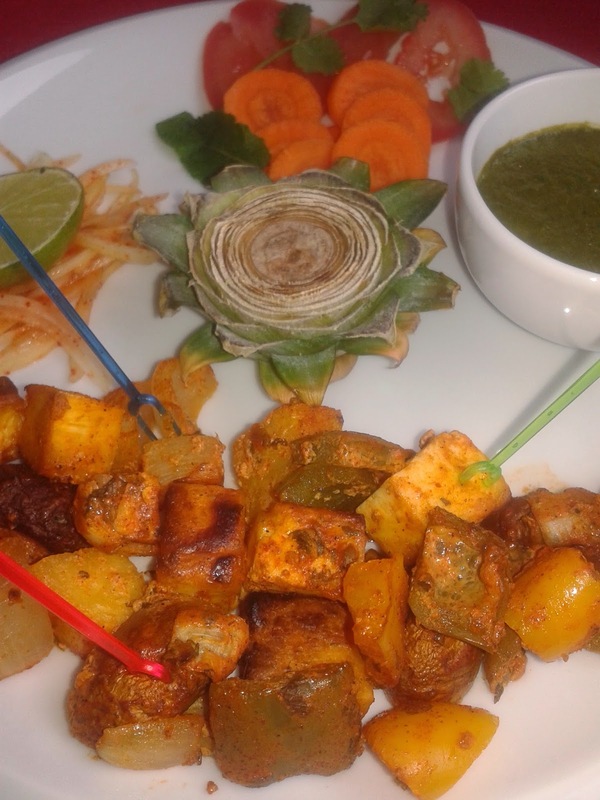 The colourful veggies grilled/baked together is a feast to our eyes. Grilling/Baking of the veggies brings out the natural sweetness from the veggies and are great at taste. 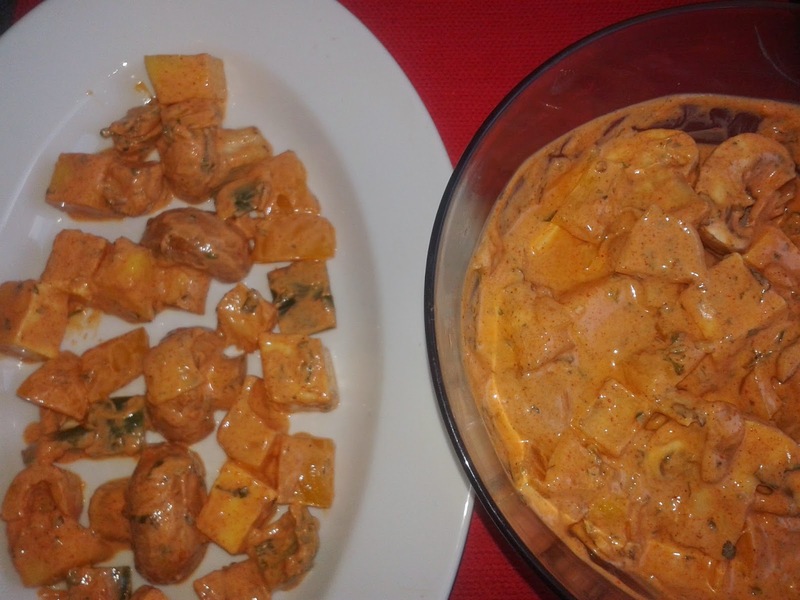 The chatpata marinade keeps the flavours even more yummy. To make the marinade chatpata you can even add chat masala. I have not used chat masala but still the marinade was very tasty. 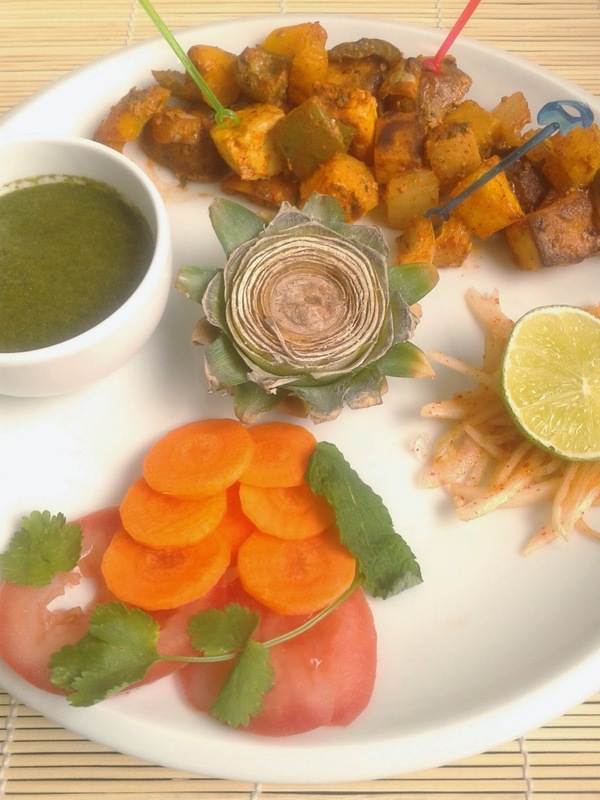 The Veg Platter is served with Mint Coriander Chutney and salad by the side. Today I have prepared my platter using a standard baking oven, however you can also grill or barbeque. So lets proceed step by step. 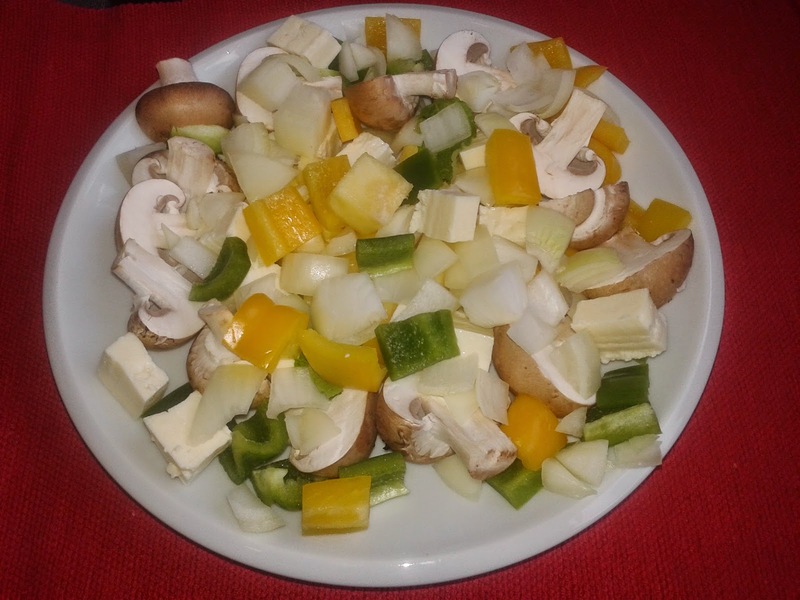 To make this Veg Platter cut some bell peppers, paneer, mushrooms, onions and pineapple in small cubes. I have used green and yellow bell peppers but you can use different colours to make your platter more colourful. You can use any other vegetable that you like e.g. sweet potatoes, sweet corn etc. 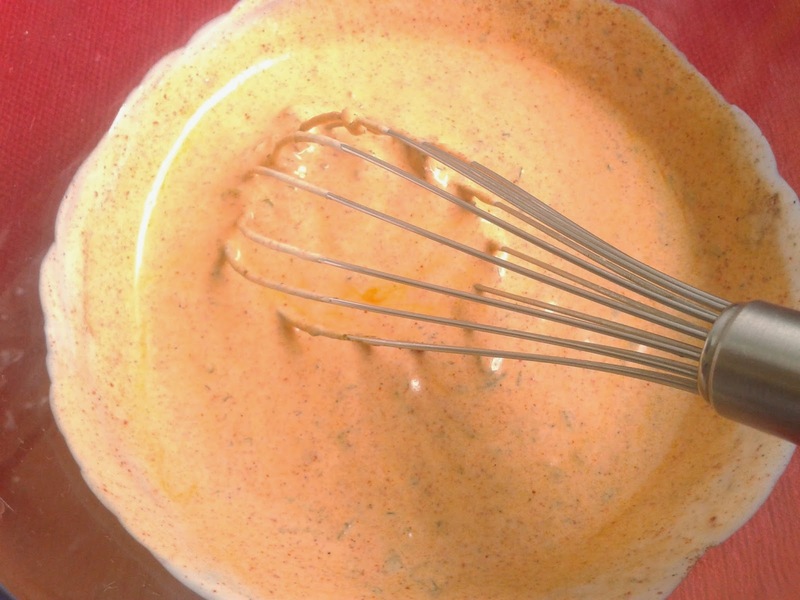 To prepare the marinade take about 1.5 cups of well beaten plain curd or yogurt in a bowl. Add coriander, mint and green chillies paste, garam masala, red chilli powder, salt, lemon juice and little olive oil. Mix all the ingredients well to avoid lumps and prepare a smooth marinade. If you like the marinade more red you can use a little more red chilli powder. 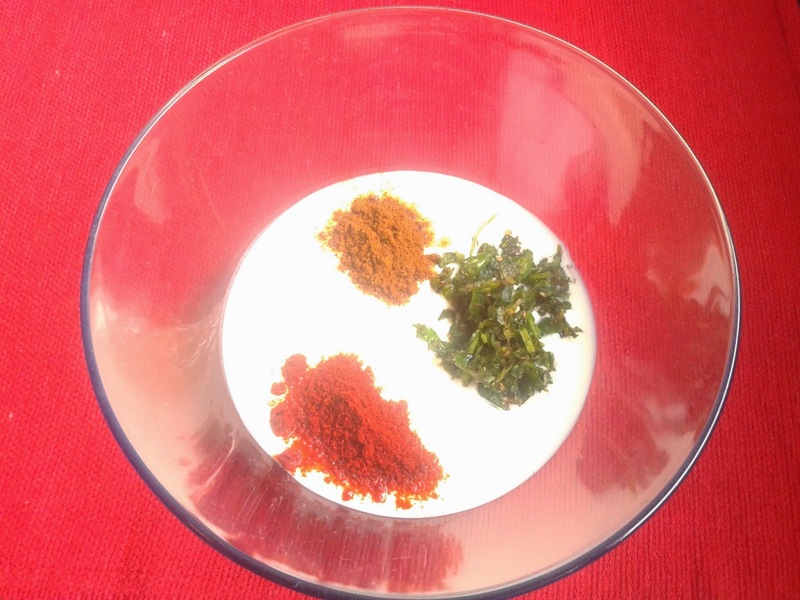 I always prefer to use good quality kashmiri mirch powder. This will not make the marinade too spicy but give a nice flavour and colour. 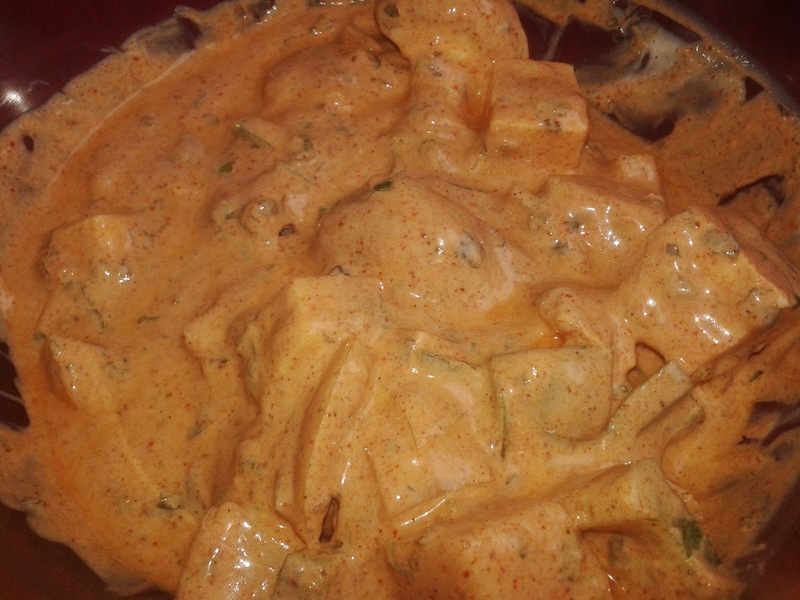 Taste the marinade and make sure it is chatpatta and spicy. You can also add a little chat masala if you like. Now add all the cut vegetables and paneer to the marinade. Mix well and make sure that all the veggies are nicely coated with the marinade. Keep the marinade for 1 hour in the refrigerator. The more the marinade stays in the refrigerator the better the flavour. Minimum 1 hour is recommended. This is how the marinated veggies will look like after 1 hour. The veggies can now be baked in an standard oven, tandoored or even barbequed. Even a good quality convection microwave oven can be used. Usually we do not have tandoor or barbeque at home so I have used an oven. Preheat the oven at 220 degrees for about 15 minutes. Place the marinated veggies in an oven proof plate like below and put inside the oven. Allow the veggies to bake for 20-25 minutes till there is a nice smoky texture on all of them. Serve with Fresh Coriander and Mint Chutney, onions and salad. In a bowl take curd and add garam masala, red chilli powder, salt, lemon juice, olive oil and mint-coriander-green chilli paste. Mix all the ingredients well. The marinade is ready. Chop all the vegetables into small cubes. Add the chopped veggies to the marinade till the veggies are properly coated with the marinade. Keep the marinade in refrigerator for 1 hour. Preheat the oven to 220 degrees for 15 minutes. Place the veggies in an oven proof plate and put it in oven. Allow the veggies to bake for 20-25 minutes. Serve hot with green salad, onions and mint coriander chutney.